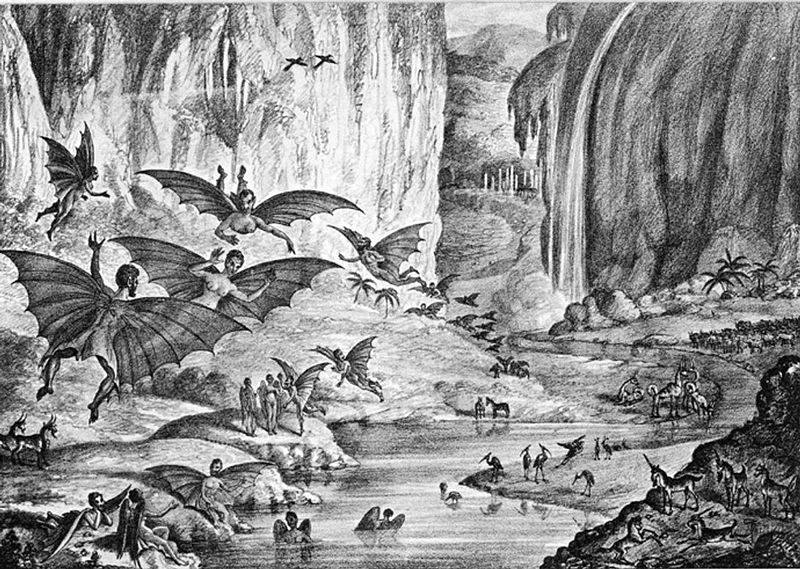 Amphibious Monsters and the Great Moon Hoax. After a not insubstantial break I have finally composed another post for your perusal – the theme this time is something to do with monstrousness and nineteenth-century imagination. What Chambers describes here is a monstrous aquatic chimera; straddling definition as part fish, part reptile (ichthyosaurus literally meaning fish-lizard) the ichthyosaurus represents a candidate for science fiction. In a somewhat dismissive review, Francis Bowen refers to such creatures as ‘amphibious monsters’. Chambers’ successive linear development theory, from animalcules to perfect man, not only posits these monsters as a ‘necessary step’, but also uncomfortably creates an evolutionary link between monsters and man. This very link is a popular source of anxiety in the late nineteenth century, whether as the transitory monster of Jekyll and Hyde, or the degenerated Morlock of The Time Machine. So I was thinking about this evolutionary monstrousness (largely in relation to parasites – my raison d’être) and I stumbled across what is now one of my favourite anecdotes concerning nineteenth century imagination. In 1835, the New York Sun published a series of hoax news stories in an attempt to boost circulation (it worked!) The stories reported the advancement of a telescope that enabled the discovery of life on the moon. Falsely attributed to Sir John Herschel, the series depicted a colourful landscape with white beaches, hills topped with quartz crystals, glades studded with vermillion amethysts, a bay of rainbows, lunar palm trees, unicorns, goats, biped beavers, and bat people. There were even ‘strange amphibious spherical creatures’ that rolled around the pebble beach. companion of our larger, but less favored world. Though perhaps little more than a really good read, the series does demonstrate the evolutionarily monstrous, made good. The Derridean notion of ‘turning them into pets’ holds true and dispels the myth that an alternate path of evolution would produce anarchy. As the theme of the ‘monstrousness’ seems in conference vogue this year (themes for two I’ve been to already) I hope I’ll hear more about this in September when I present a paper on the fictional pandemic at the 10th global conference for ‘Monsters and the Monstrous’. My paper will be entitled: Death, Disease and Discontent: The Monstrous Reign of the Super-Virus.